Hey guys, we all know that use of internet has been increased to its peak. some of the internet users are getting addicted to the various websites especially the social media websites. Some of them are Facebook,Twitter and some others. These people or their parents realize at some context of time, that they are not concentrating on appropriate material and they are wasting their valuable time on useless things. People like us I mean to say that Bloggers also gets addicted to Blog. At that time they want to block the websites which are disturbing their concentration. For them there are some ways to do that. I will explain you how to Block a website on PC and also MAC. Also read: 15WAYS TO ACCESS BLOCKED WEBSITES. 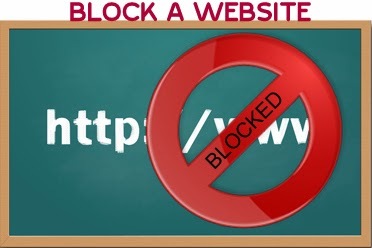 In this section I will give you procedure, how to block a website over all Browsers on a PC step by step. First open RUN and type "C:/Windows/System32/drivers/etc" in the text box of windows explorer. If windows is not installed in C drive then replace "C" in above command to the appropriate drive. Then click OK button. 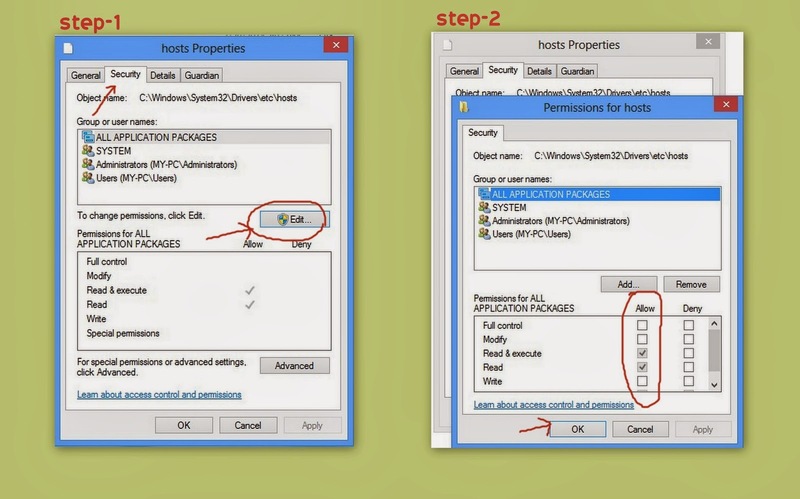 It opens a new window, In that window double click "hosts" file and open it in Notepad. Then in that "hosts" Notepad at the end first identify the lines "127.0.0.1 localhost" and "::1 localhost". Below that two lines place the cursor and type command "127.0.0.1 website", here in the command website must be replaced by the name of the website which you want to block from accessing. Then go to "tools" option and select the "save" option. Like this you can Block any number of websites on your PC by following the same above procedure. If the "hosts" file was not saved after modification then you need to change the Administrator permissions. At that time, Right click on the "hosts" file. Select "properties" option from the displayed options. Now choose "security" option from newly opened window. Then click on "Edit" option above the permissions list. Then check all the boxes below the option "allow". and then Click on OK button. Then save the modified file. Otherwise save the modified file in different location like desktop or other folders and then Drag that file to the previous location. After this modifications the specified websites in "hosts" file are not allowed by your PC to open in any of the Browser present in your PC. First of all if you want to make any serious system changes to your MAC then it is good to have backup of the original system settings. It is optional only for security purpose. Let me explain you the procedure to Block a Website on MAC. First open "terminal" by going to "Applications -> Utilities -> Terminal". Then terminal will ask you to enter "Password". Then you enter your password but it is not displayed there but it is saved. So please enter password carefully. Then "hosts" text file will be opened. Check whether the hosts file locked or unlocked. If "hosts" file is Locked then Unlock it clicking next to the "Locked" icon in the header portion and then selecting "Unlock". In "hosts" file text edit below the line "fe80::1%lo0 localhost" place the edit cursor. And then type the command "127.0.0.1 website" here website means the name of the website which you would like to Block on your MAC. This is the procedure to Block a website on MAC. You can Block any number of websites across all browsers on MAC. In Chrome there is no inbuilt option to block any website. The only thing to do is to have Chrome Extension which will block the access to the websites. There are many extensions to do so. But I will suggest you only two of them. They are. Right Click anywhere on the website. Then a list of Block Site options are displayed from them choose "add current site to Block List" if wish to add that website to black list. Then the site is added to Block list. With this Block Site extension, we can block some of the words from displaying in websites, we can set times in which a Website must be blocked so that the particular website does not work in that time. It also has Uninstall protection so that the persons who don't know password can not uninstall it. Block Site Plus is another extension in Chrome which can be used to Block website based on the measure of how much time you would like to spend on that website per day after that time website is automatically Blocked. Once leech Block Add-on is enabled on you Firefox browser. 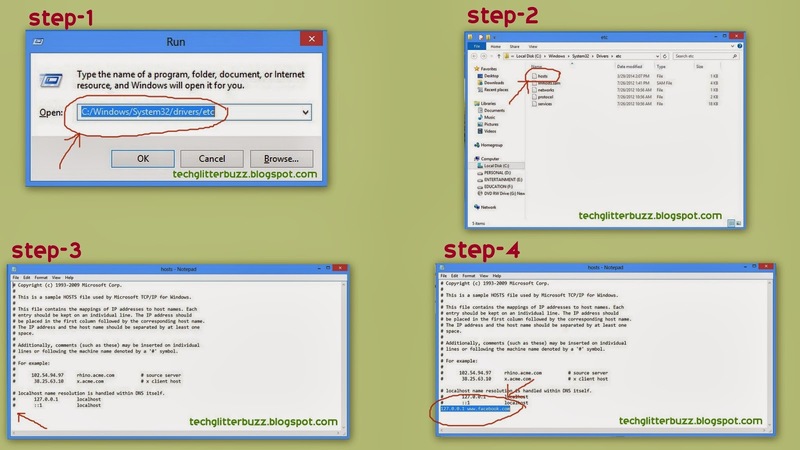 Then open Leech Block and specify the name of the website which is to be blocked in the Firefox Browser. With this extension we can specify when to block a website and how to block a website. This extension can Block websites in six sets. Option of setting password to this Add-on is also available. In Internet Explorer we can directly Block a website with the help of internal settings of the Explorer itself. Open Internet Explorer and click on Tools (Alt+X) option in internet explorer. Then select "Security" option on newly opened window. Click on "Restricted Sites" and after that click on "Sites" button. Then add the website which you wish to Block and click the "ADD" button and then exit. Then the site is Blocked from accessing through the Internet Explorer. Open any Browser in your system and enter IP Address of your router in the address bar of the browser and press Go button . [usually this IP Address may be 192.168.0.1 or 192.168.1.1 or 192.168.2.1]. Then enter Username and Password to enter into the Router configuration. Then go to section where we you can Block websites, Computers and access during certain times of the day. For most of the Routers the section is named as "Access Restrictions". Then there enter the details of the Website and users which you want to restrict. This way you can Block websites from certain users of your system. We can Turn On Safe Search in Google by log in to your Google Account. So that Google search will show the results that does not contain the Explicit content. So that your children can enjoy clean browsing on Internet. By Turning On the SAFE settings in YouTube, we can avoid display Explicit content videos from the search results. By using Third party Applications we can Block Websites from children accessing them. DNS Angel is one of them. Always make sure that you had back up of your files before editing your "hosts" text file. If you know any other methods to Block a website On system please comment below.